Create with Gwen: Offer Ends in 3 DAYS! Offer Ends in 3 DAYS! Offer extended to take advantage of this Spooktacular Promotion! JOIN My Team as a Stampin' Up! Demonstrator for just $99, choose up to $125 worth of brand-new products from the annual or holiday catalogs, for your completely customizable Starter Kit! 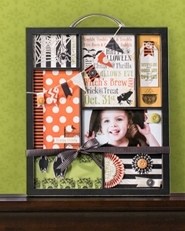 • Get a FREE Howl-o-ween project kit valued up to $60! • While the $99 price tag is exciting in and of itself, one of the biggest perks of the new Starter Kit is its flexibility! • Fee access to Stampin' Connection and invitations to Stampin' Up! events-not to mention the fantastic new friendships they'll forge and regular opportunities to get together and stamp. • For those who can't get enough of the products and samples...you'll get sneak peeks, Title Benefits Bundles, Stampers' Showcase, and a FREE demonstrator magazine, Stampin Success, filled with beautiful photos and project ideas! • and last, but certainly not least...Get a 20 percent discount on Stampin' Up! products! No trick - just treats when you join Stampin’ Up!® in August!